The Split Red Oak Vent Free Log Set by Duluth Forge features Patented Dual Fuel Technology which allows you to purchase this log set for LP Gas or Natural Gas. You will experience a mess-free, realistic, quality gas log set that includes the convenient feature of a Thermostatic Control giving you the ability to customize the heat settings in your room. This rich, hand-painted, cement log set provides excellent details emulating the realism of a wood fire. 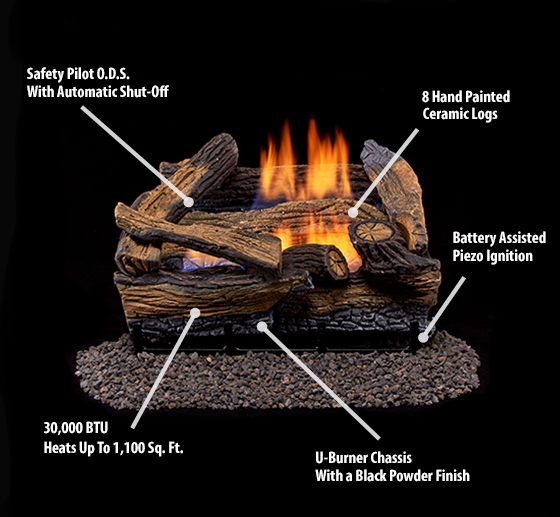 This log set is designed to reflect a split stack and was developed using real wood molded to create the look of a new fire with bark and split wood elements being the focus. Receive and enjoy both quality and the efficiency of 30,000 BTU of Vent Free Heating with the Split Red Oak Vent Free Gas Log Set.